Just In! 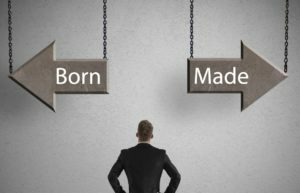 Are Leaders Born Or Made? - Take Charge Inc.
Studies indicate that leadership tends to be only 30% genetic. * Leadership can be learned. Before you invest time and money in leadership development courses, it is crucial to recognize that although leadership can be learned, not everyone can learn to be a leader. A recent study** indicates that only those who have a desire – a burning passion to develop leadership skills – will learn how to lead. Shown a strong interest in developing the behaviors that make for good leadership. Indicated a desire to improve their current level of effectiveness. Face it, those unwilling to mercilessly scrutinize their leadership skills are not likely to be open to making the necessary changes and adjustments to their behavior to become more effective leaders. *Arvey, R. D., Zhang, Z., Avolio, B. J., & Krueger, R. F. (2007). Developmental and genetic determinants of leadership role Journal of Applied Psychology, 92(3), 693-706. Act now to determine whether your supervisors and managers have the skill needed to lead … click here for a free 3-min assessment that will help you pinpoint where to focus improvement efforts. AND – then offer the same free assessment to your current and aspiring leaders. Click here (use the self-assessment) to offer the assessment to your “future leadership pool.” Those who take you up on the offer are those who demonstrate 1, 2 and 3 above. Want to learn more about leadership learning that is better, faster, cheaper – where your aspiring and current leaders can access micro-learning lessons that build the leadership skills that lead to success – where they can learn anytime, anywhere – and where you can facilitate their learning and mentor them along the way? – click here.